Since today is the day after Thanksgiving and the leftovers didn't seem to make it past lunch time in our house, I wanted a simple dinner for tonight. It dawned on me that this would also work great for leftover turkey if you are lucky enough to have any left. This hit the spot with my twin toddlers. It is the first time they have ever asked for thirds in their life. Meanwhile, cut chicken into small squares. In a large skillet start the chicken cooking. Season with salt and pepper. When it is about half cooked, add the frozen broccoli, can of mushrooms, can of mushroom soup and fat free half and half. Stir everything together. Add noodles and sprinkle with cheese. Stuffing is a matter of taste. People tend to be very particular about their stuffings or dressings. They like them a certain way. My favorite is the basic bread stuffing recipe (made from scratch or the package from the store) with breakfast sausage and apples. Use any basic stuffing recipe but before you sauté the vegetable cook one pound of breakfast sausage (crumbled up) and and a cup and a half of diced apples. Amazing!! It is my favorite way to eat stuffing. There will be no picture because I am not hosting Thanksgiving (for the first time in my adult life.) There also probably will not be sausage and apple stuffing in my future since I am living in a Muslim country where it is hard to find pork products. So make this and send me a picture!! Best wishes for a happy and safe holiday. Or as we say here, Iyi Bayramlar! While I could probably eat Chicken Tortilla Soup every single day forever (okay, maybe not...) I think John could do the same with Tomato Soup. Almost every time I check out of the grocery store, I have about 10 cans of Campbell's Tomato Soup in my cart. I thought I'd try my hand at making homemade, but wasn't sure if I'd match up to the store bought variety that he's used to. John gave this soup a passing, but told me not to fancy it up with fire roasted tomatoes (sorry, it was what I had in the pantry!) He also recommended that I puree it a bit longer than I did, and I have to agree with him on that one. The random chunk of onion really threw off the texture. But the flavor was really good and this is coming from someone who cannot stand canned tomato soup. I'll definitely make this again, and with the grilled cheese sandwich on the side it was superb! Rough chop the onions into small pieces and mince up the garlic clove. In a medium pot, melt the butter and saute the onion and garlic on medium heat until it becomes translucent. Add canned tomatoes. Using either an immersion blender or a regular blender, puree onions and tomatoes. Add yogurt and heavy cream to the pot and lower the heat all the way. Add salt, pepper and Parmesan cheese. Stir until cheese has melted in the soup. Add a dollop of pesto to individual bowls when serving. Serves about 4. Chicken Tortilla Soup is my favorite homemade soup. I think there have been days that I've eaten it for breakfast, lunch and dinner. Yes, I know... call me weird. Every time I make it I make it a bit different. Sometimes I make it with no chicken, so it's a Vegetable Tortilla Soup, sometimes I combine the two and add a ton of veggies, with chicken. Sometimes I throw in some rice, other times I leave out the rice. This version is just a simplified Chicken version without too many bells and whistles. Some of the pantry ingredients: Green Chili Peppers, Chicken Broth (or stock), tomato sauce and a can of black beans. 2 chicken breasts chopped into bite size pieces. About a tbsp of Ancho Chili in Adobo Sauce. It comes in a can. I empty the can into a freezer safe ziplock bag and freeze it. That way I can chip off just the amount I need. This stuff is spicy! In a large pot, saute the onion, garlic and bell pepper in 1 tbsp of oil on high heat until it starts to brown around the edges. And seasonings... I use cumin and oregano. About 2-3 tsp of ground cumin and about 1/2 tbsp of dried oregano. Add frozen corn (about 1 cup) and black beans. I usually don't drain them. Add tomato sauce and about 4 cups of chicken broth. Simmer on low for 30-45 minutes until chicken is cooked through. Do not boil or chicken will get tough. Serve with tortilla chips, cheese, avocado and sour cream if you like. This dessert is delicious. It is really quick to make and is really neat because it is not something you often see served for dessert (in the States at least.) This makes it ideal for dinner parties. It is yummy, soft and warm. It is really excellent served for dessert after strong tasting foods. It is not a particularly diet conscious food, but really is worth it. Put the milk, water and sugar in a saucepan and bring to a boil. While that is going on-- in a heavy saucepan melt the butter, and add the semolina and nuts. Brown the semolina and pine nuts lightly. Watch them!! They burn quickly. Stir together the liquid and the dry ingredients. It will sputter so be careful. Mix until thoroughly incorporated let cool until warm and not hot. Fluff mixture then press into a bowl and invert onto a plate to serve. 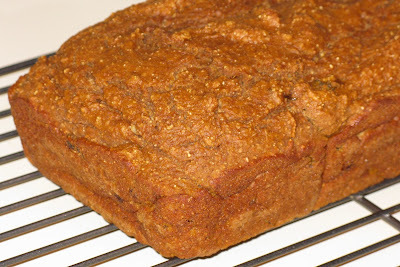 You could top it with cinnamon or toasted pine nuts. I asked John if he had any ideas for dinner this week and he said we hadn't had hamburgers or spaghetti in a while. The poor boy he asks for spaghetti and hamburgers... last night I served chicken puttanesca (sorry, I didn't photograph it for The Frickin Chicken!) and tonight I made Curry Burgers. Not exactly what he had in mind! But they were SO good. I was licking my fingers. The girls ate them too, while saying yummy, yummy. The other thing... they were a snap to make! Gently mix the seasoning into meat. Don't over mix or your burgers will become tough. Divide into very thin 4 oz patties. Cook on a hot griddle, about 3-4 min per side, you must cook turkey until it is done, but don't over cook it. I served on Oroweat Sandwich thins with a curry mayo. Cut sweet potato into french fry lengths. Coat all of the fries in oil. Sprinkle with salt and cinnamon. Broil for 10 minutes, flip the fries with a spatula and then broil for 10 more minutes. I figured tonight was a good night to cook chicken. Mostly because I bought a bunch of chicken at the store the other day and haven't had any creative inspiration on cooking it. Since I'm trying to eat smaller portions of meat, I've been really into one pot meals. This way a scarce amount of meat doesn't seem as noticeable if you can fill up on veggies. I've never made anything quite like this but it was really tasty. I'll definitely be making it again. Dice onion and garlic. Pour oil in very large skillet or pot on low heat and add the onion and garlic. Chop carrots, bell pepper and celery and add to the onions. Cut potato into moons and add that to the skillet. Cook for a few minutes on medium heat to get the potatoes started cooking. Add seasonings: oregano, thyme, turmeric, salt and pepper. Cut chicken into small squares. Add to the skillet. Add a can of tomato sauce or diced tomatoes. (I didn't have tomato sauce but I didn't really want chunks of tomato, so I pureed it in my blender.) Drain the green beans and add them to the skillet too. 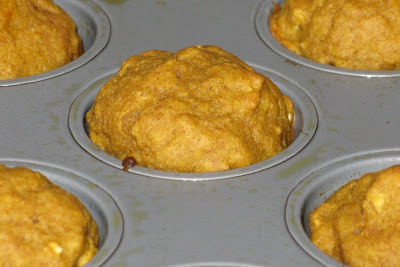 In a small bowl mix 1/2 cup of chicken broth and the flour whisking with a fork until there are no lumps. Pour into the skillet and stir. Add more chicken broth depending on how thick you want it. Bring to a simmer and cook covered for about 15 minutes or until chicken is cooked through. Do not boil or the chicken will get tough. weight watchers: Serves 4 at 4 pts per serving. First, let me apologize for how horrible this picture is. I am a terribly food photographer. I’m working on it. If it means I need a fancy new camera, then so be it. That’s the lengths I will go to for you people. I’m just that generous. College cafeterias are supposed to be miserable, right? Poor quality, high calorie, all seemingly designed to accelerate the addition of the Freshman 10 (or 15 or 20) to the fastest rate possible. Mine was no different. Although, I will admit, after a little awhile, I developed a sort of Stockholm syndrome and actually started liking the food. It is with a heavy heart (among other heavy things) that I make that admission. 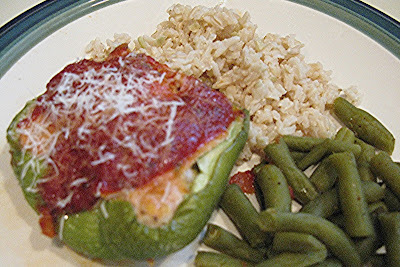 One of my favorite meals was stuffed bell peppers. I’m sure they were just mass produced Stouffers numbers, but Stouffers knows how to make nicely edible comfort food, so points to the cafeteria for knowing what works. I wanted to make this dish at home, but the versions I’ve always had included cooked rice, which I usually did not have on hand, and I didn’t want to add extra time to a dish that already needed a fair amount of oven time. By then, my husband’s beloved Giada (his foodie princess) showcase a recipe that didn’t use rice. Yay for no extra carbs! Plus, ketchup! I always have plenty of ketchup (say what you will about the carbs there, but I don’t care)! Win win! So I’ve tweaked the plan a bit, and this is how I make it at home. Feel free to make a Mexican version with salsa as a topper (as said husband does even though I’ve already made it with slightly Italian leanings). Cut the bell pepper in half and remove seeds and ribs to create a small pepper boat. Mix the remaining ingredients (expect for the tomato topping) gently until combined. Fill each pepper boat with stuffing and top with tomatoes. Sprinkle with cheese. Arrange in a casserole dish and bake in a 400 degrees for 40-45 minutes. This is most of the ingredients. I decided not to put in two cans of tomatoes, instead I used some beef stock for more liquid. I also added some vinegar and Worcestershire sauce to "brighten" the flavor at the end. Put them in a big skillet and saute. While they are sauteing chop your celery and carrot and add to the skillet. This is a nifty tool I bought from Pampered Chef. It helps break up meat and it works really well. Lean meats can sometimes be harder to break up than higher fat meat. Also, I never drain my meat, because I cook with such lean meat there is usually no fat to drain. If you sub a higher fat beef or even a higher fat turkey meat you may have to drain before you add seasonings. Once the meat is broken up a bit, add the seasonings. I like to add them before the meat is fully browned. I think this flavors the meat more. Once it is brown, it doesn't take in the seasoning as much (in my opinion.) Stir the seasoning in to mix with the meat and veggies. Add your liquids: the tomatoes, tomato sauce, beans and beef stock. I added the Worcestershire sauce and vinegar later because it needed the acidic element added. I didn't drain or rinse the beans because the liquid that they are packed in is high in starch (leached from the beans) and will help thicken the chili. Add your raw noodles, cover and let simmer for 20 minutes or until the noodles are tender. substitutions: you can sub beef for the turkey. If you don't have tomato sauce use either some tomato paste and extra beef stock or water. OR use a squirt or two of ketchup. You can skip the parsley, I just had it on hand. You can probably play around with the seasonings but I'd stick with the chili season or perhaps substitute a taco seasoning (it'll taste a bit different of course!) The main idea is cook with what you have and don't feel like you have to follow the recipe exactly!